The University of Central Florida (UCF) is determined to gain designation as one of the state’s preeminent institutions of higher education, and a historic administrative appointment has been made to help the large, Orlando-based institution make it happen. 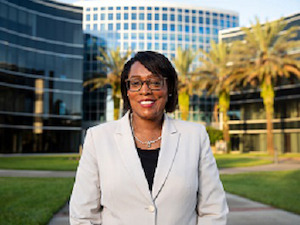 Dr. Elizabeth A. Dooley, who had served as interim provost since April, has been appointed provost and vice president for academic affairs and is the first woman and the first African-American to hold the position in the school’s 55-year history. Dooley will play a key leadership role in UCF’s goal to attain 11 of 12 key state metrics within three years, with six already met. Student success is at the heart of the designation, and Dooley has the education, experience and passion to help the most challenged students achieve. Before arriving at UCF in 2015, Dooley spent upwards of 25 years at West Virginia University (WVU). She was associate provost for undergraduate academic affairs, the founding dean of the University College and interim dean of the College of Education and Human Services. She also was the department chair of Curriculum Instruction/Literacy Studies and Special Education, and directed numerous university programs. Dooley credits her vocational success to her parents, who instilled important values in her and her five siblings as they grew up in the small town of Fairmont, West Virginia. Their father was a coal miner who worked his way up to federal safety inspector, despite having dropped out of school after the seventh grade to work and take care of his mother and his two little sisters when his father died. Her mother had finished high school and earned a nursing certificate, but chose to stay at home to focus on raising the children. Dooley’s mother died before Dooley graduated from Alderson Broaddus College with a bachelor’s degree in elementary education with a specialization in mental retardation. Her father died between the time she received a master’s degree in special education with certification in learning disabilities from WVU and began earning a doctor of education there. “They planted the seeds but did not see the fruit,” said Dooley. But the love of learning and community engagement and advocacy that they had cultivated in her continued to inspire her. As an undergraduate, during a cooperative education assignment, she got her first experience interacting with children with learning disabilities. Dooley initially planned to work in curriculum and central administration in a school district. However, the ability to have a wider, multiplied impact on students motivated her to enter the realm of higher education. “I was always about scale and impact,” she said. It’s a mindset that can help UCF enhance its mission to “lift lives and livelihood,” as Dooley described it, in an environment of excellence and high expectations. About one in five of UCF’s 67,500 students is first-generation. UCF intends to become a university model that other schools emulate and scale in their own contexts, she said, and she envisions that happening as UCF gains preeminence status. UCF president Dr. Dale Whittaker praised Dooley in an article published Wednesday in UCF Today, calling her “the right choice” and citing her strong leadership while interim vice provost for teaching and learning and dean of the College of Undergraduate Studies. As Dooley settles into her post, she is encouraged by a deep well of support, from the academic community to her husband, daughter and sisters.